Thank you for allowing me to address you with my thoughts and concerns about the education of our blind children in the public schools today. I taught regular education in a school which addresses the needs of children whom we call troubled readers. I have taught fourth, fifth, and sixth graders who are for one reason or another still emerging readers. In this capacity I have attended many literacy seminars. As I sat there I heard over and over again, �All children should be reading by the age of nine.� I couldn�t help wondering if they really meant �all children,� because I know a group of children who are not reading at grade level. That is when my excitement, passion, and enthusiasm began for working with our blind children. The definition of literacy is being able to read and write with meaning and purpose. As I sat in those seminars, I heard a lot about how children learn to read and why they need to read. We all know that reading is important. We have reading programs in prisons because we know that if prisoners can read and write their success rate when they get out of prison is much higher. The state of California realized that children had to do better before graduation. We had children graduating who could not complete job applications. This problem needed to be addressed in public education. As a result the state of California put a lot of money into this area. As a regular education teacher I was a beneficiary. In that capacity I received a lot of training and eventually became a trainer of trainers who would go on to teach other teachers about literacy. I learned about what that really meant and what the research said. I would like to reflect on the way this relates to our blind children. First of all I learned that reading is learned. Children do not all of a sudden �get it� so that one-day they can read. Reading has to be taught purposefully. However, if you think of how our blind children are educated currently, the delivery system is limited. Most of our blind children are taught by itinerant teachers. This is a good system�if it works. However, in my district it means that our students are visited by an itinerant teacher maybe two times a week for an hour. They get an aide who comes another two or three times a week for another hour. In our case those aides do know some Braille. So now we are talking four, maybe five hours a week. Sometimes the child has a one-on-one aide who knows no Braille. This person is usually learning Braille at the same time as the student. If literacy is learned, who is doing the teaching of our blind children? If our sighted children were taught reading five hours a week including the code, we would be appalled. I couldn�t help wondering who was working with our struggling blind readers. We learned that the research shows that students need to be fully immersed when they are learning to read. That means print must be everywhere. They need to be exposed, not only to textbooks, but also to menus, newspapers, and magazines. Those are the kinds of things our kids need to see to learn to read. Our sighted children get this immersion; do we really think we are immersing our blind children with Braille during a mere five hours a week? Another thing the research taught us is that in order for children to learn to read, they need prior knowledge. If you are reading a story about a sailboat, you have to know what a sailboat is or the story has no meaning. Sighted children can look at pictures or videos and develop a concept of a sailboat as they read the story. Who is exposing our blind kids to such information while they are reading about the sailboat? It simply cannot be done in five hours a week. I want to stop to say that there are some very dedicated teachers in the regular education classes who attempt to address the needs of their mainstreamed blind students. I know what that is like because I was one of those teachers. I had a class of thirty-two students who had thirty-two different learning styles. However, in general what happens is that the most needy child with the most severe needs, who should have one-on-one instruction, does not get it. I wonder if the regular education teacher is handing that blind child a sailboat to feel while the sighted children are looking at a picture? I was really worried about that. We also learned that when a child is struggling, early intervention is vital. The research shows that if children are not reading on grade level by the third grade or the age of nine, they have lost ground for the rest of their reading careers. They will never be the good readers they could be, no matter how much instruction they get. So early intervention for struggling readers is very important. However, what I was hearing from some teachers of the blind was that you cannot expect these children to read on grade level because they are blind and they are reading Braille. Therefore they are going to be slower. Already we were losing ground because our children weren�t reading at grade level, and no one thought they needed to. Just about that time, when I was becoming very frustrated, I learned of a parent in the area who was threatening a lawsuit against the district for noncompliance. This parent knew better. She was not going to accept the poor service-delivery model in place in my area. Shortly thereafter, lo and behold, the district implemented a full-immersion Braille program, which the teachers had been trying to get for the students for three years. The only problem was that no one was available to fill the position. I was asked if I might be interested in applying. I am very happy to tell you that I have proudly started my new job as the teacher of the visually impaired in Apple Valley, California. I would like to tell you what I saw when I got into my new classroom. The program I was supposed to implement was set up for eight academic blind Braille-reading children. These students ranged in age from first to fifth grade. What I saw was very frightening. They had problems with social development, daily living skills, and other areas of responsibility according to the California Guidelines for Educating Blind and Visually Impaired Children. However, when you visit a child for only two hours a week, what do you focus on? Everyone assumes that everyone else is teaching these skills. I had ten-year-old children who could not tie their shoes. I had a six-year-old child who could not put on her own coat because she could not find the top. And these were bright children. That was what I saw in my first hour in this new position. All my lesson plans went right out the window. I saw children who pounded away on the Braillewriter for a while and then asked, �Did I do it right?� They had no idea if they were writing the words properly. When I taught sighted children, they checked their own work. These children did not know how to. They were not reading what they wrote. They were functioning significantly below grade level. That is how they became eligible for the Special Day Class Program. They were already in trouble. We also know from research that certain reading behaviors must be taught. I found that my blind students had very poor reading habits. They were not sitting erect, their hands were flat on the page, they read with one hand, their other hand was not trailing, and they read one letter at a time. These reading behaviors would have been corrected if someone had been monitoring the students. In regular education we were constantly nagging students to sit up straight and hold the book upright. No one was doing that for the blind children because the teacher of the visually impaired was there only twice a week. Since no self-correction was going on, the students were not learning to read and write properly. As I have said, literacy means reading and writing. We have learned through research that children need modeling as they learn to read. Who better to do that for them than someone who is proficient in the reading and writing of Braille? They need deliberate instruction. We must establish standards to determine the specific things that blind children should know as they learn to read. We must all agree on these as we instruct them. They also need background knowledge. Blind kids do not learn from pictures and videos; they learn from real life experiences. So before they read a story, we need to make sure that they understand the concepts and ideas and items mentioned in that story. That requires a teacher who cares enough to see that the blind child is instructed in reading. Teachers need multiple strategies. When a teacher visits only once or twice a week, she is only teaching a code. This is the first part, but children also need strategies for learning to read, such as using context clues and talking about what the story is about. They also need appropriate feedback. They need someone to tell them how well they are doing, not just giving them a little pat on the back. Our current delivery system does not make that possible. I am not sure what it will take to make the changes necessary, but as we move forward on the passage of our Braille bill, we need to keep these things in mind. 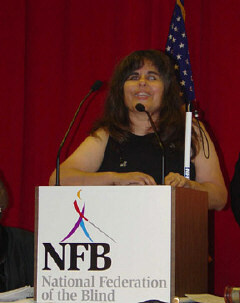 The title of my talk states that our blind children are lost. The opposite of loss is gain. Our children need to be gaining the skills that they need for literacy. The opposite of losing is winning. We need to make sure that our children are winning functional literacy skills so that they learn to read in time to be able to compete equally and be competitive when they are grown up. The opposite of losing is finding. We need to make sure that our children are able to find their full potential. Even our children with additional disabilities need to be getting as much Braille as they can absorb so that they will have a wide range of choices in their future too. I am very happy that I now get to work with blind children. I hope that what I have said here will challenge you. The passing of the Braille bill is exciting, but our work has just begun.